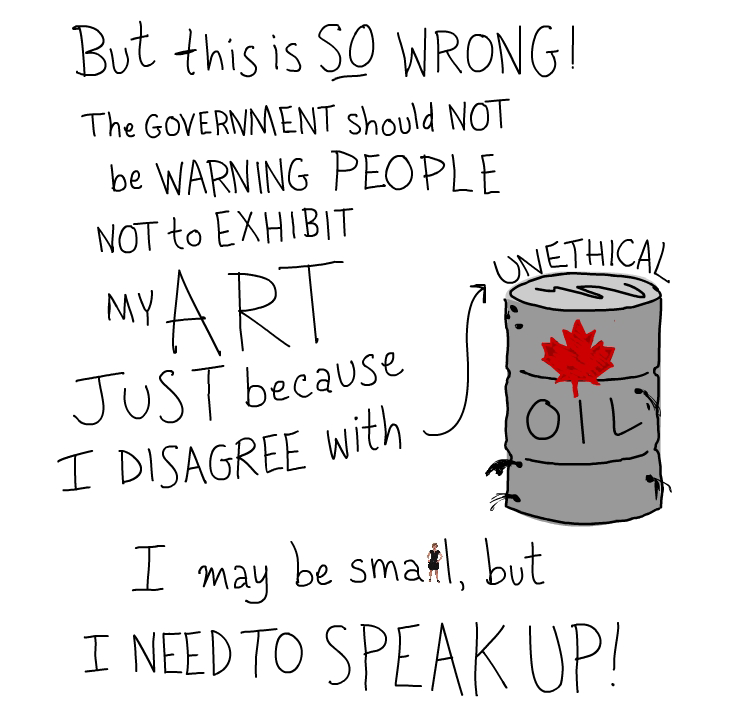 Is fear of the “Dirty Oil” label behind Canada’s tarring of artist’s European show? Please, add your name to the petition! What about the truth? 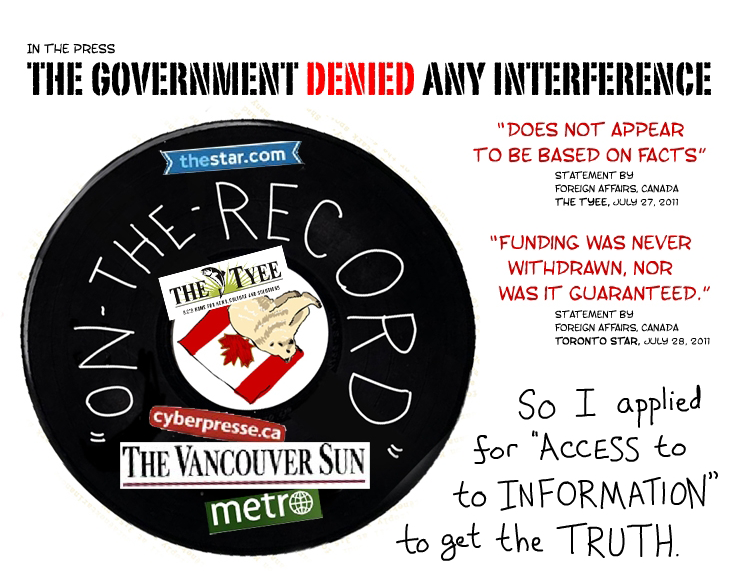 Has the Canadian government’s commitment to its policies superseded its commitment to the truth? What about the government’s duty to protect its citizens? Is it right for the Canadian Government to do everything it can to protect its economic interests, even if it means harming the well-being, or destroying opportunities, for some of its citizens? And if so, who decides which citizens or groups are disposable? What about free speech? Do these actions by the government — deliberate efforts to silence dissenting opinions about its policies — put the Canadian right to Freedom of Speech at risk? Read the highlights or download the entire ATI release of 165 pages of documents. Thanks to everyone who helped bring this message to the streets of Ottawa through LoudSauce. Executive Summary ATI: Summary of key pages in the Access To Information documents. 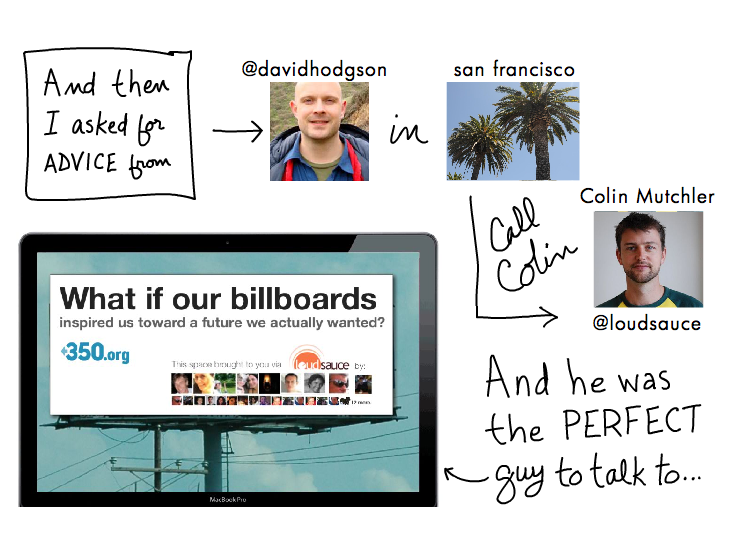 LoudSauce: a new way to fund media space for ideas that matter. 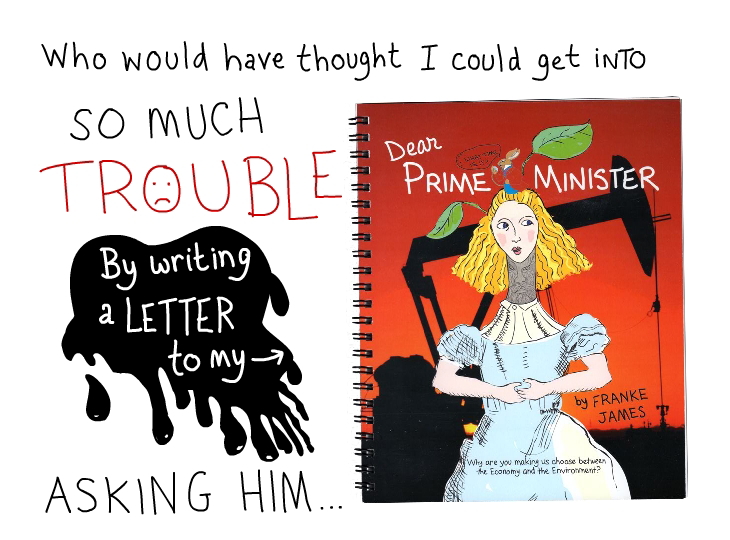 Dear Prime Minister: Why are you making us choose between the economy and the environment? 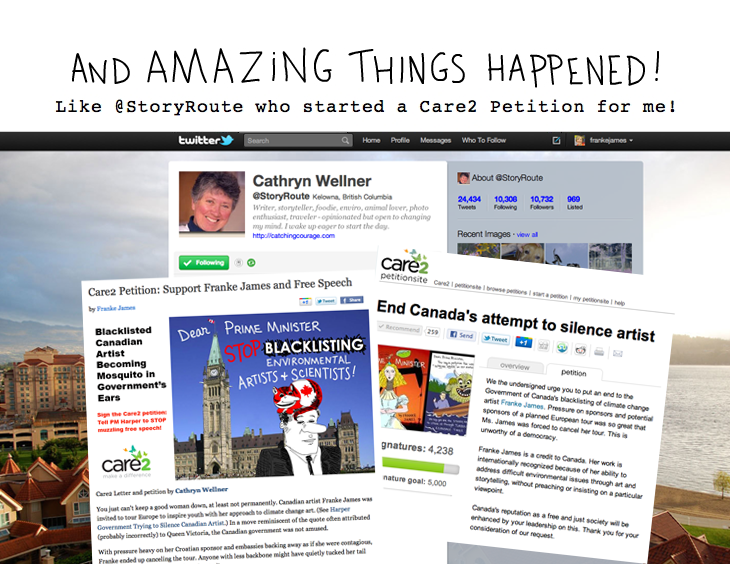 CARE2 PETITION: Please sign the petition for free speech for Canadian artists. Thanks to Cathryn Wellner for spearheading this! 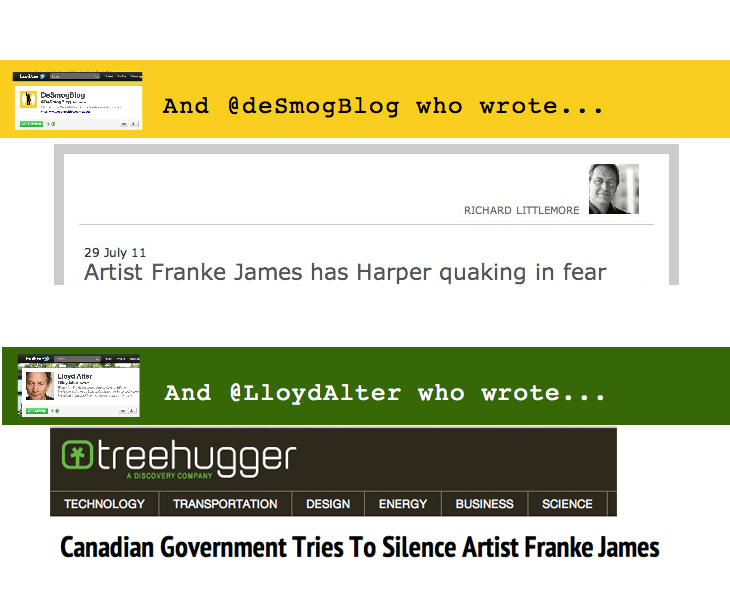 VOICES-VOIX SITE: The facts: Silencing Canadian voices. 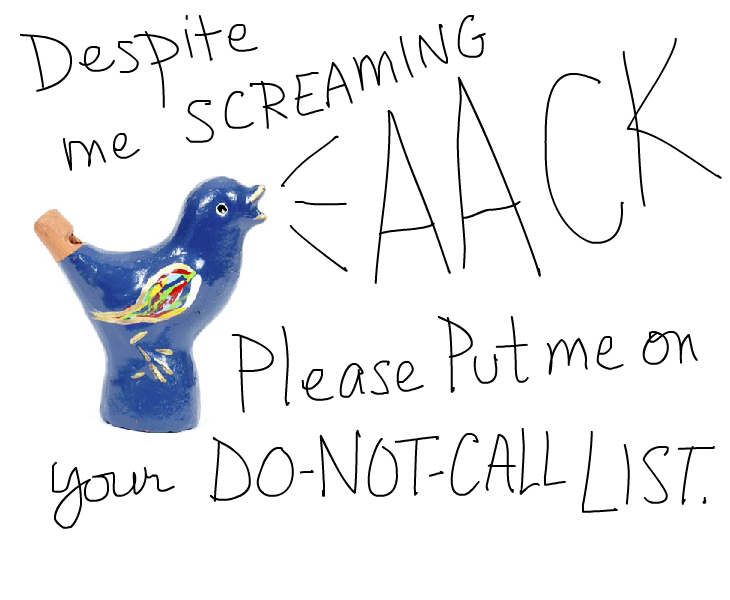 All photos and illustrations by Franke James except as noted: istockphoto © photo of Bird in “Do-Not-Call-List”, © modified heads in “Common Concerns”; Getty Images © cockroach; Icon photos of funders are © each individual funder. In May 2013, Franke James published this essay, and seven others, in “Banned on the Hill“. Read more here and buy it below at Amazon.com. Comment policy: Please leave a thoughtful and respectful comment below. Comments may be edited for length or clarity. Comments which are abusive, insulting, promote hatred, use excessive profanity, are off-topic, are spam, etc. will be deleted. Franke, these past few months must have been the most perplexing+frustrating+empowering time in your life. Your story is worth telling to our children and grandchildren. We all can learn from you! 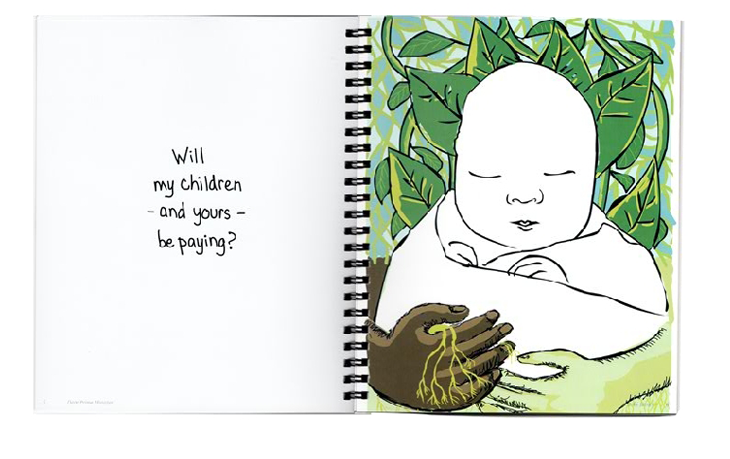 Your story as told in this provoking visual essay is really the clarion call of these times! 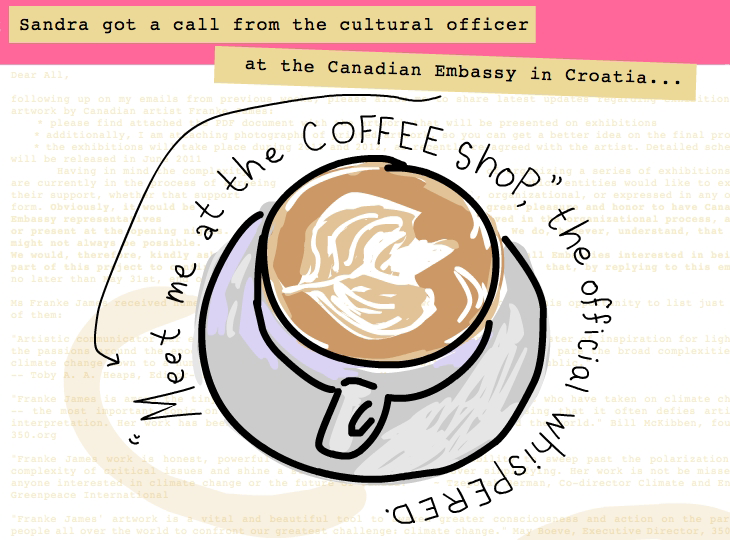 I hope you do a workshop at the occupy camp in Toronto, I was down there yesterday and sounds like it would be well received! I would be glad to volunteer to help organize and facilitate it… who knows, perhaps there are others who would like to assist?! Let me know- the sooner the better as the weather is getting colder every day, and there are signs waiting to be created! 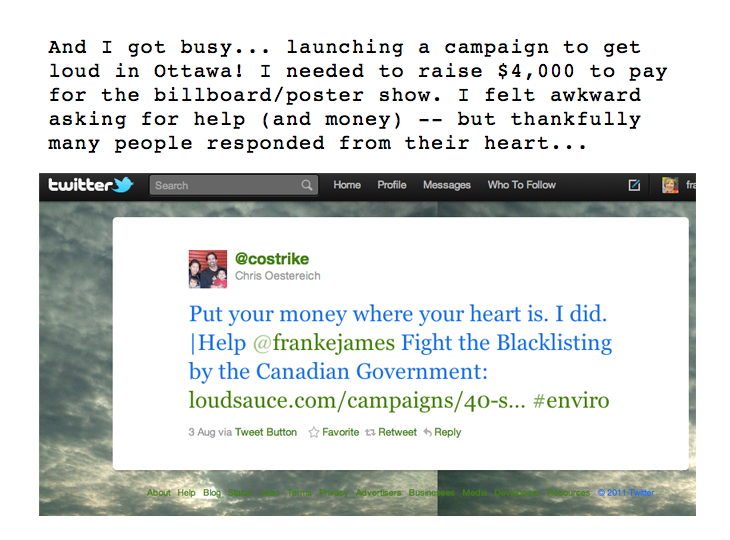 THANK YOU, Franke James, for putting up such a clever, courageous & glorious looking fight against the Harper Government! CONGRATULATIONS on winning with flying colours! You are a much needed inspiration to all Canadians who do not agree with the Conservative Government’s policies — who are pushing back against the Harper Government and it’s dictatorial rule. Vive la Resistance! Franke, this is so brilliant, what a story! 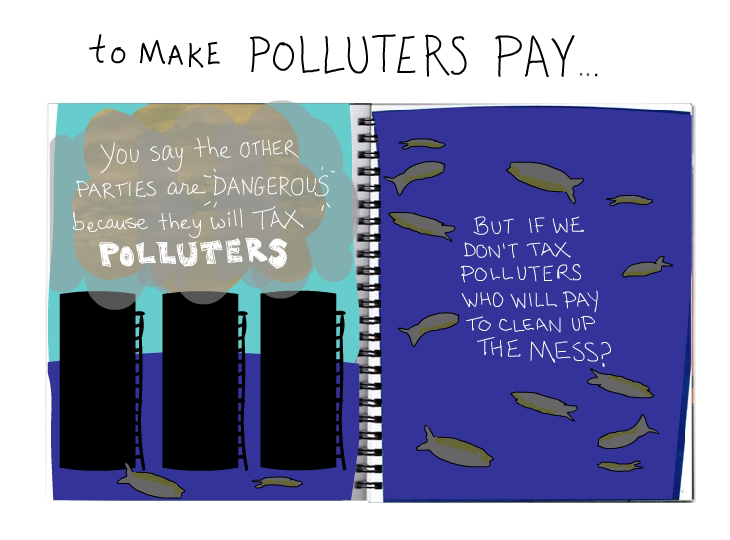 The way this has come together is like a perfect storm, with OWS and huge keystone pipeline protests last weekend. So exciting to see how you’ve just taken that negative energy directed your way and rode it like a solar-powered broom, redirecting with grace, humor and determination that governmental pile of bully poo onto its own ugly self. So glad to have been a small part of it, can’t wait see some live footage from Ottawa. Franke, you ALWAYS inspire others by “doing the hardest thing first.” This fight is such a difficult one, yet you keep going…Thank you for bringing us along on the ride, and keeping us up to date via your amazing visual essays! I just returned from Washington, DC where I joined hands with more than 12,000 friends to “circle the White House” and ask President Obama to join us in stopping the Keystone XL pipeline from carrying dirty oil from Alberta to Texas. We are filled with hope that we will be successful and stop this pipeline. 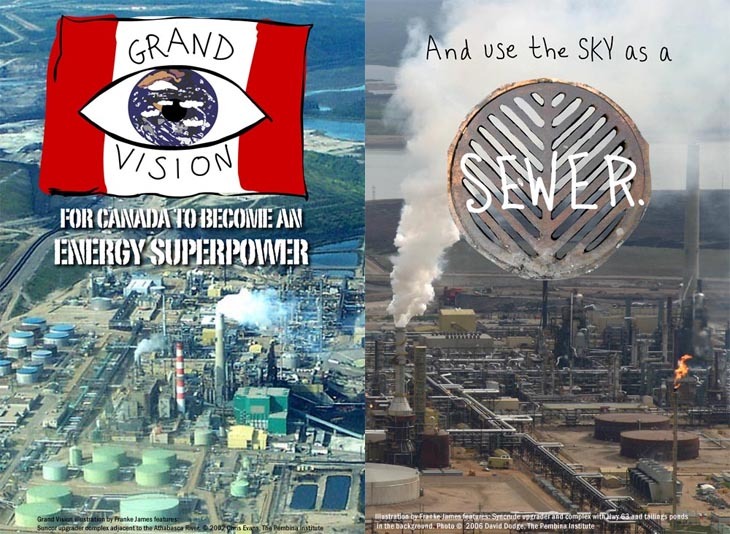 With the help of brave Canadians, the next fight to block these “arteries” and give the Tar Sands a heart attack, (to quote Naomi Klein!) will be on Canadian soil. 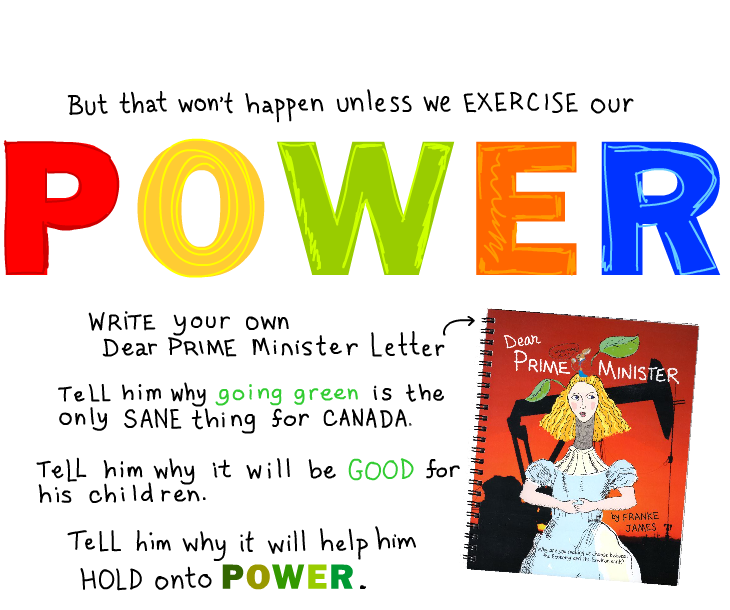 YOU, your essays and your stand in this fight against the Harper Government will help all of us stand up and fight for our children’s future and for a future less ravaged by Climate Change then the future we are currently headed for! The width of space between the ears of this government is not proportional to the size of the brain. There seems to be a lot of “noise” that fill the gaps and this is probably the cause of much concern to the medical profession. They cannot operate without revealing the blank space. They are also censured and cannot talk about it. My uncle who works in parliament showed me the top secret document and has now lost his job. A camera was hidden in his office. The government wants to hide this medical fact from the population. Illustrators such as Franke did not know about this so she was censured. Who knew that I had a friend (Franke!) who was considered an international threat to Canada’s safety & security because of her environmental stand – and that Ottawa banned her?!?!? This is SO AWESOME! I’m sorry for your trouble, but I just love how much more attention you are getting as a result, and the fact that this information is coming out. The Cons can’t bear the truth being exposed. Thank you! 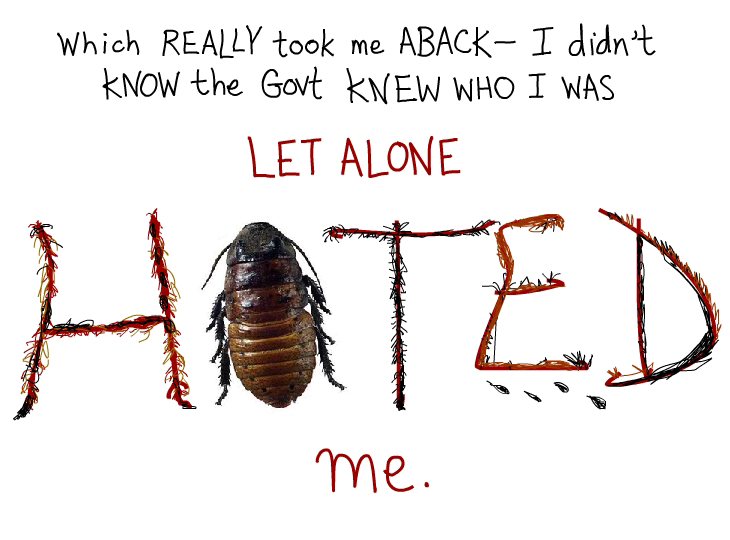 It takes bravery to stand up to this corrupt government. Bravery doesn’t feel good when it is happening. Otherwise it would be something else. You rallied yourself and came out doing what you do so well. 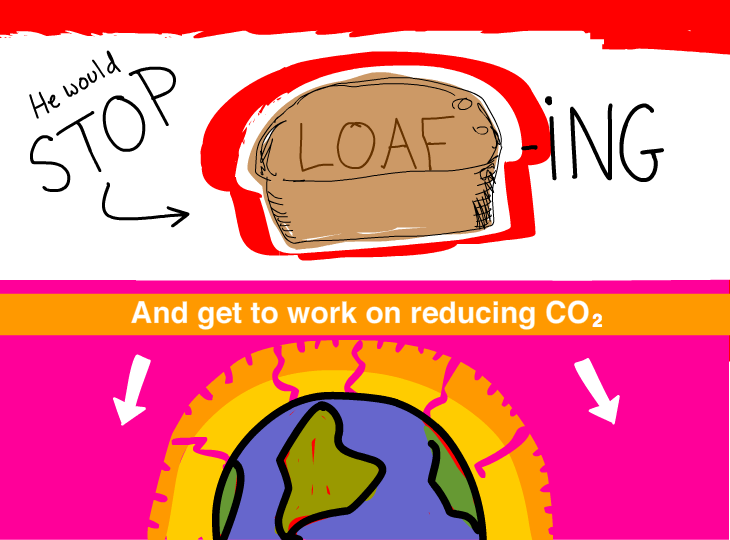 You’ve made a contribution to climate progress and have set a positive example for everyone else. Thank you. What a grand show. I wish that there was a way that your show could travel the whole country. You are so excellent at what you do as a person and as an artist. I live in Kitimat, the proposed ‘end of the line’ for the Enbridge Northern Gateway Project, that will see bitumen thinned with condensate that will flow from Fort Mac across 700 streams and rivers, countless mountains, to end up in my town in ‘tanks’ to be loaded to supertankers the size of 3 football fields, to float out to open water, while navigating hairpin turns, 100 meter waves at times, and meeting a floatilla of other boats and vessels, only to end up in Asian markets drooling for our raw resources. PLEASE HELP OUR TINY BAND OF VOICES IN THIS COMMUNITY HUNGRY FOR DEVELOPMENT AND JOBS TO STOP THIS PROJECT DEAD. I am calling all human beings, parents, activists by our very nature of living here in this beautiful world, artists, visionaries, and people ready to incite change to speak of for Kitimat and my kids. 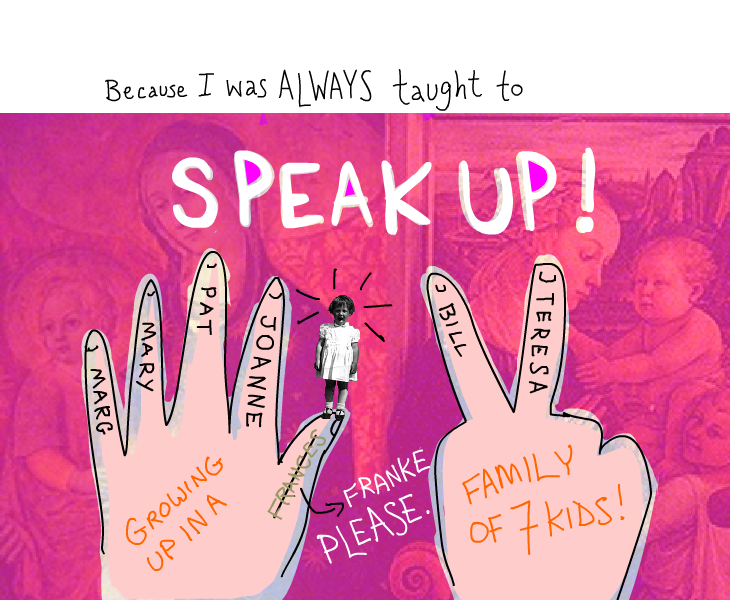 Franke, add your voice by getting in touch with me. I need you. Til then I will be moving rocks from this mountain one at a time. I send my support to you. Shame on the Harper Government!!! I hope this comes back to haunt them at election time. I think we should be proud to live in a country where a grassroots PR campaign such as this one can become so successful, without eliciting government intervention. Ms James managed to turn a dubious funding opinion by one person, which was then correctly quashed by their superiors, into a bonanza for her and her message. Can’t do that happily in too many countries around the world! Freedom in speech no matter if expressed in words or in art are one of the human rights!! Hello. I have listened to the whole CBC “The Current” program this morning and I am actually very happy that the government has decided to spend the taxpayers’ money on something more useful than this rubbish. 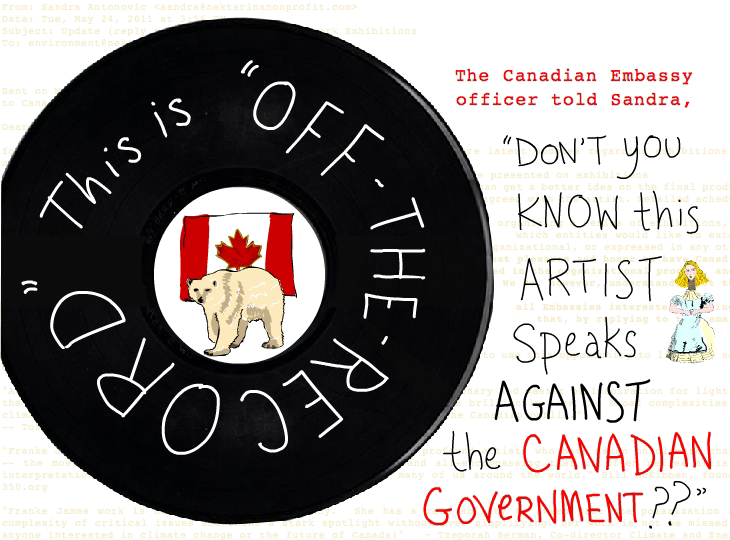 Your art is not “banned.” It’s just not being paid for – by this government anyway. And that’s their right, just like they might pay for one road to be built and not another. To conflate a business decision with a constitutional issue, and trump it up in the media as your rights being trampled is a bit much. 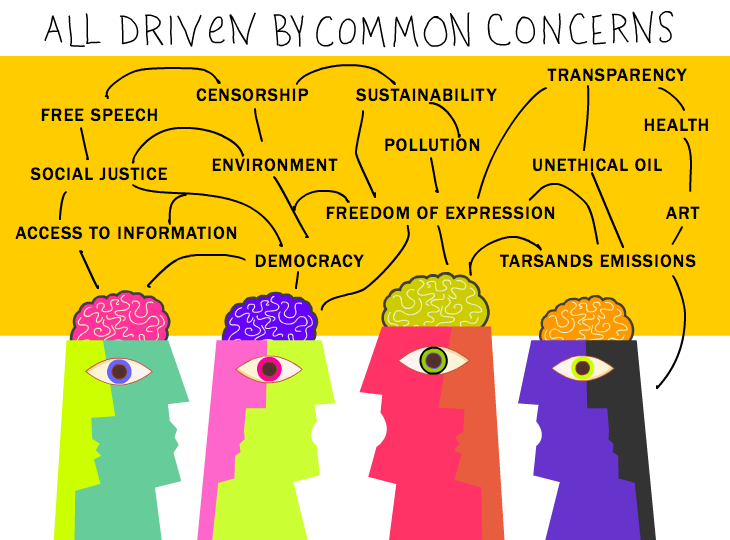 A measure of your talent as a communicator, but a bit much as an issue. 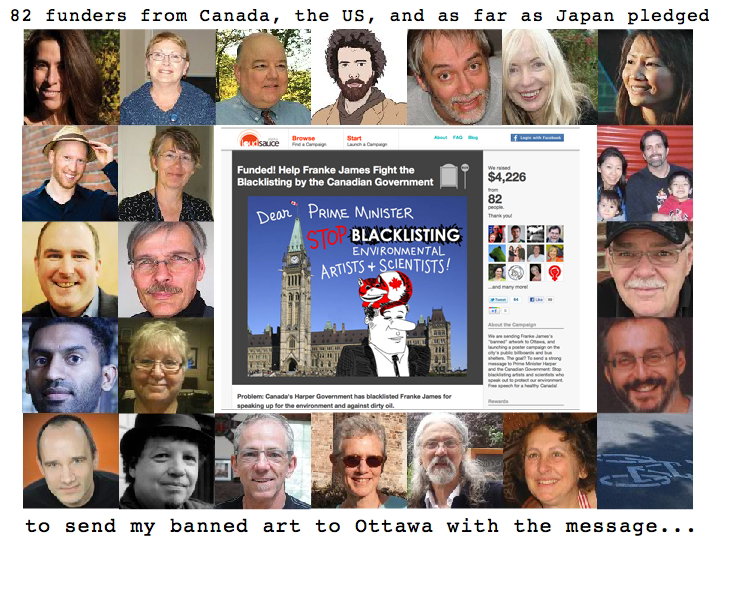 My art was indeed “banned” — the Harper Government warned my show producer not to go ahead with the show. The token funding was not the issue. 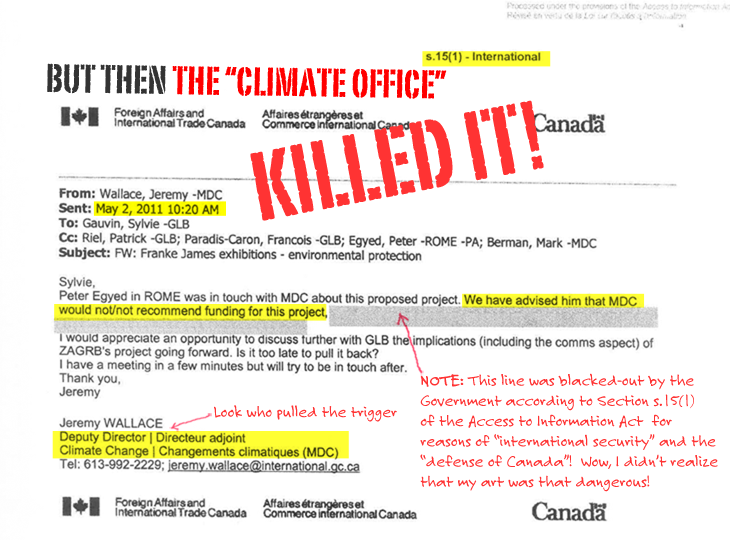 The fact that the government denied the funding was ever granted — but which ATIP docs prove was granted (and then killed by Jeremy Wallace at the Climate Change office) is a sign of their attempts at a cover-up. They continued to interfere for months after the funding news broke. They were determined to kill the show. And they succeeded. My job now is to shine a bright light on their dirty politics. 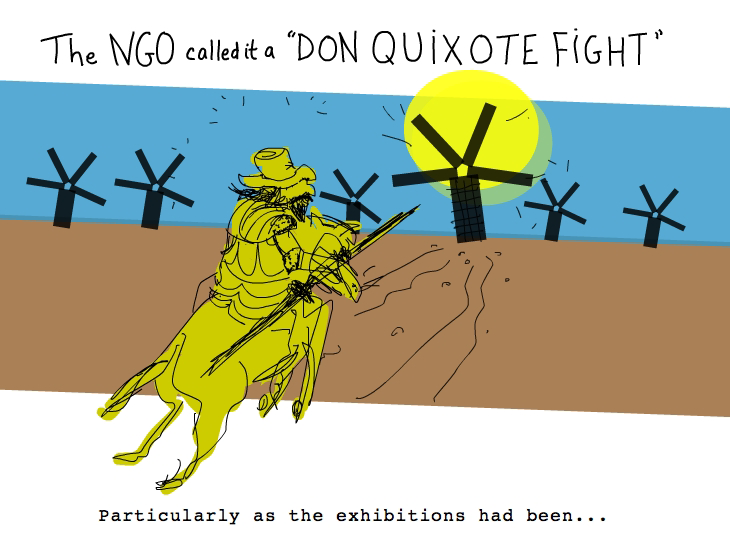 “In the past few months we have encountered many difficulties in organizing the exhibitions, usually connected to interventions of the Canadian Government… at times we felt patronized and even intimidated”. Congratulations for your amazing story. Please come to Manitoba (home of the dying polar bears) with your story. 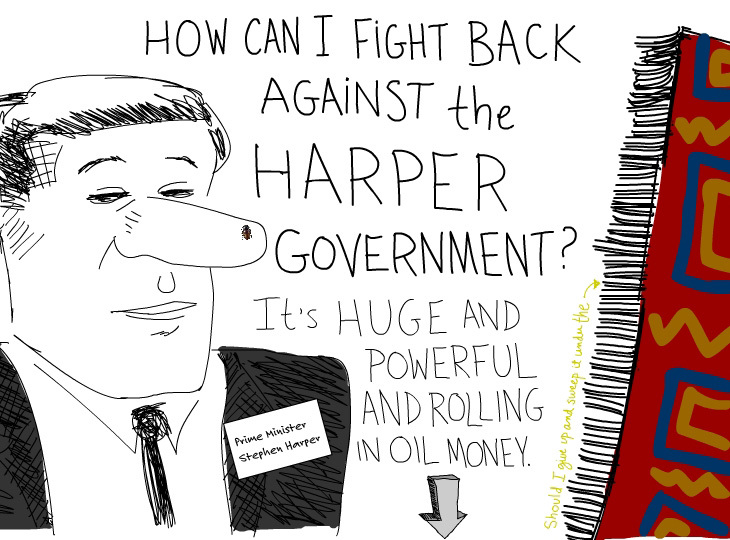 We cannot allow Harper to continue to bully everyone he disagrees with. Wonderful visual essay, as usual. 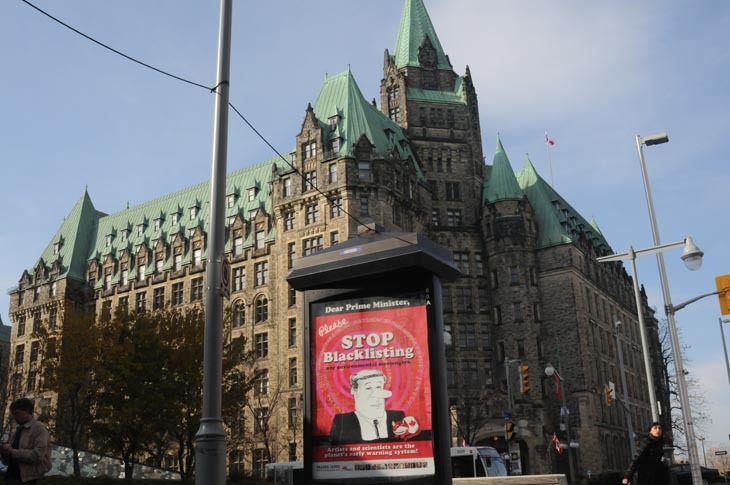 I am so glad you stood up for yourself, and love that you launched a billboard campaign right outside parliament hill! Thank you for being such a large noisy voice in this fight, we are all behind you! You are a national heroine. Thanks for your support (and everyone else who has taken the time to comment). When a bully beats you up, your best defence is to yell very loudly and gets lots of eyes — around the world — watching what’s happening. 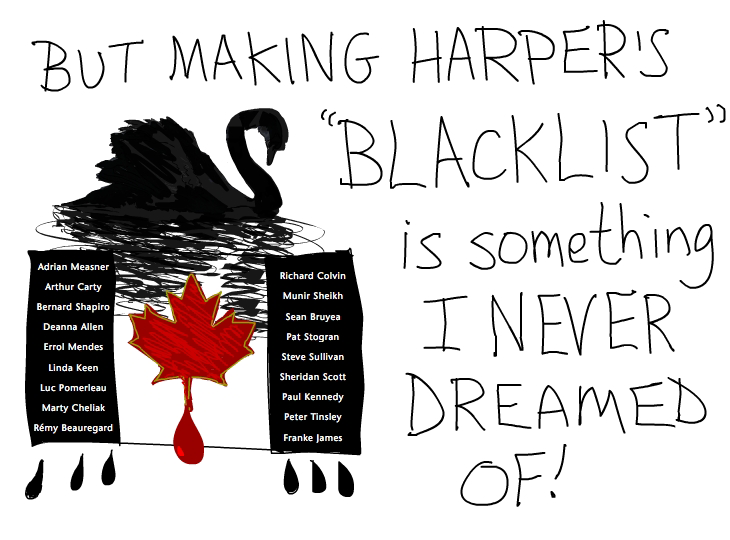 If everyone who is blacklisted by the Harper Government made a big stink — I think we’d see a lot less of this undemocratic, unCanadian behaviour happening. As a Canadian citizen I have a right to voice my opinion — even if that means disagreeing with my Dear Prime Minister. 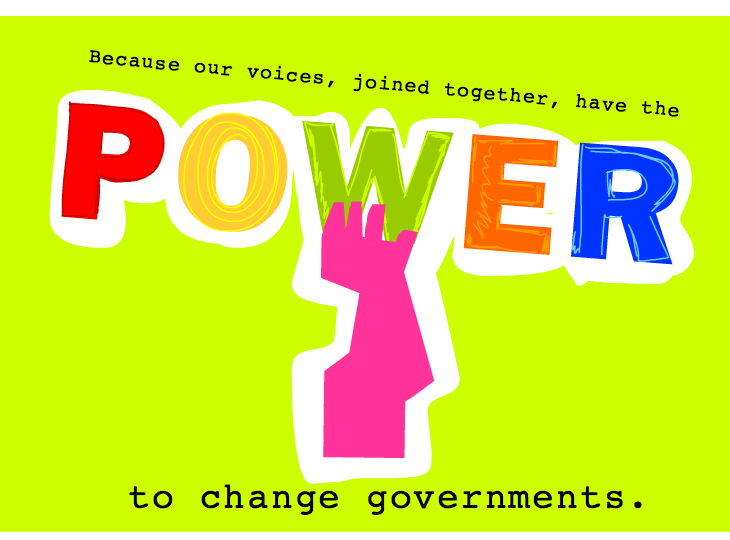 Insisting on “One voice, One message” is no way to run a democratic country. Thank you for sharing your story and art. It is not only for us but more for our children. I am forwarding this to my 10 year old grandson. 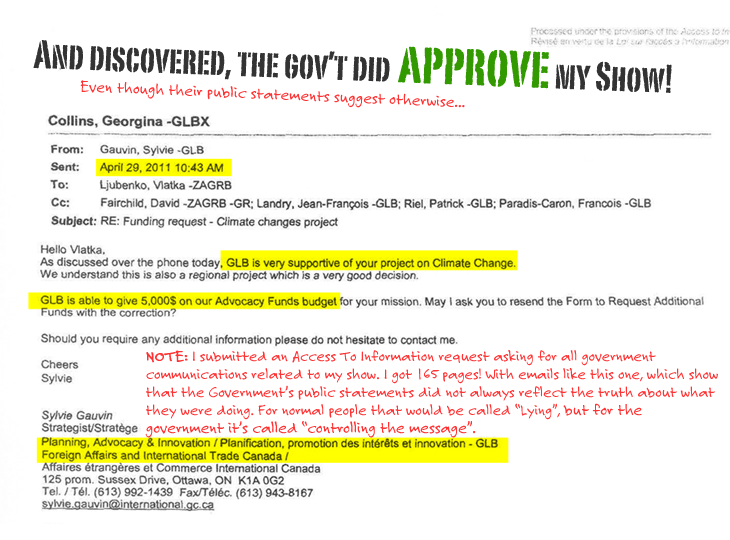 This will give him more answers and questions about Alberta, oil and Harper. Franke, fabulous! Friends of Franke: let’s think of ways to give her commissions to sustain her as an artist who will speak truth to power, as the Quakers say. 1. Purchase my book “Bothered By My Green Conscience” on Amazon. 3. Invite me to give a talk and green conscience art workshop. 4. Share my news with your friends and network. 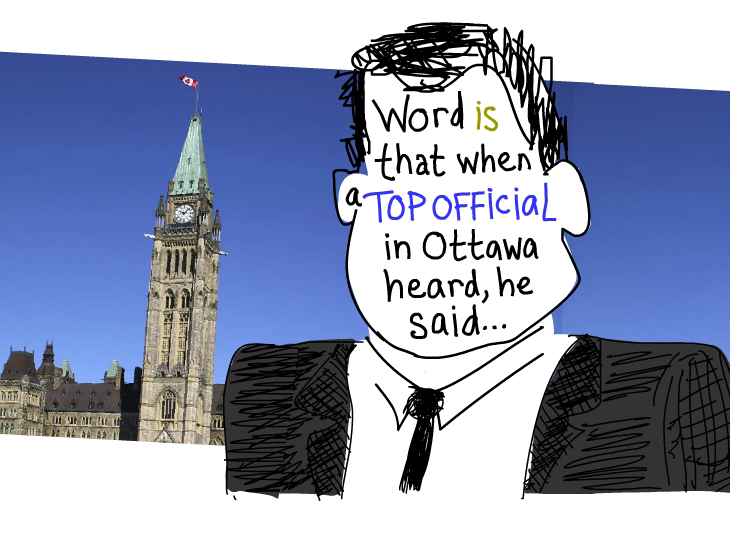 Next week I’ll be publishing a new animated video of my “Banned on the Hill” story. 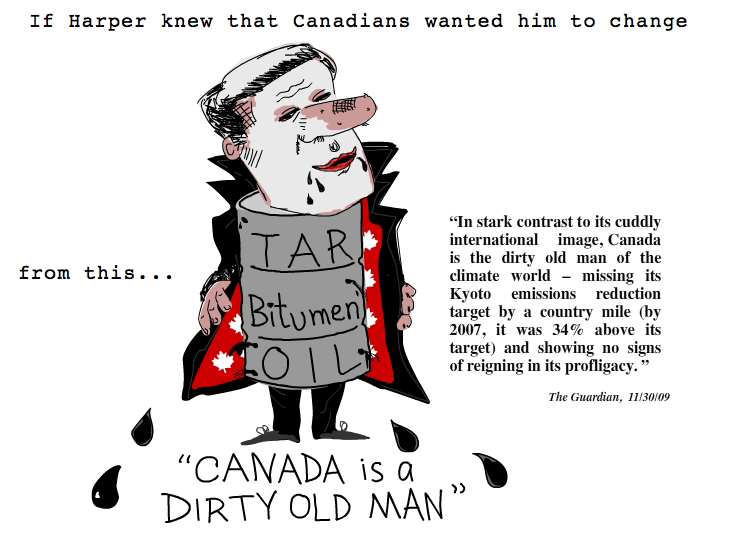 Harper – So just exactly who died and made you guys god anyways? It seems to me that you think that your paltry majority in the house gives you the right to run roughshod over the remainder of us. Well it ain’t so and it’s not going to wash. We will not go away. Everything you do is being scrutinized and posted to the web where thousands and thousands of us will see it and then push back. Add us to your back stabbing list like you did to this person if you want, but at the end of the day there are more of us then there are you and your 1%. Look what she went and did after you guys deliberately f^cked her up. Created this web page and spread her story all over the place. 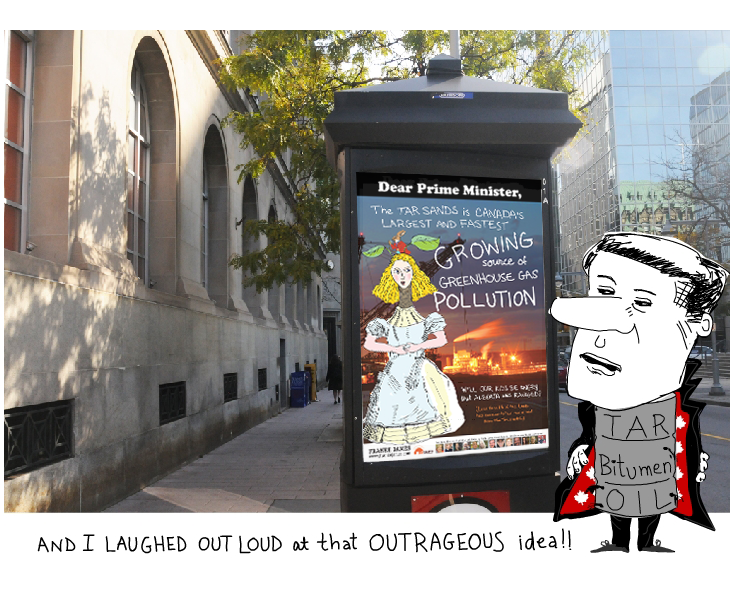 Posted billboards right in front of the Parliament Building. If you ever got out of your limousine you could take the walk of shame past the billboards like the Dean of UC Davis had to do the other day past the silent protesters after her cops maced her non-violent students. You guys really don’t get it do you. We picketed you down in Deep Bay when you dropped off some of our cash at the shellfish research facility and wound up getting blockaded for you troubles by that shell fish delivery truck for those few really uncomfortable moments. And apparently you can be gotten to by some billboards in a bus shelter. There really is no place you can hide. And while I’m at it. Where ARE the charges against your PMO’s office staff, the senior RCMP and Regional police officers, the Ontario AG and maybe the Premier as well who all conspired against the non-violent peaceful G-20 protesters. We are waiting for charges and convictions – No pensions, no jobs as a penalty and maybe JAIL Time like you gave the few 0rganizers that were charged with conspiracy and put under house arrest even though they never made it to the event. I see similarities between the lack of charges against your white collar Criminal Conspirators and the lack of charges against the fraudulent bankers that caused the world financial meltdown in 2008. In both instances Criminal Conspiracies, one against the protesters, the others fraudsters and thieves, neither of which have been charged yet and now there are Occupy protesters absolutely everywhere. Well we too are not going to go away until some heads roll on your side of the park for your G-20 Bull Sh^t antics. And you wasted 1.2 billion dollars of our taxpayer money to boot. If you are grassroots you have got to be glad for how the world has changed this push back at Conservative suppression never could have happened 20 years ago. The push back pushed the message out there further than the original exhibition ever would have so do not be quiet make noise when something stinks. Thanks for your comment. The word is spreading around the world, and I appreciate everyone’s help in sharing it. That said, a 20-city European show would have been very noisy too — which is exactly what the Conservatives did not want. 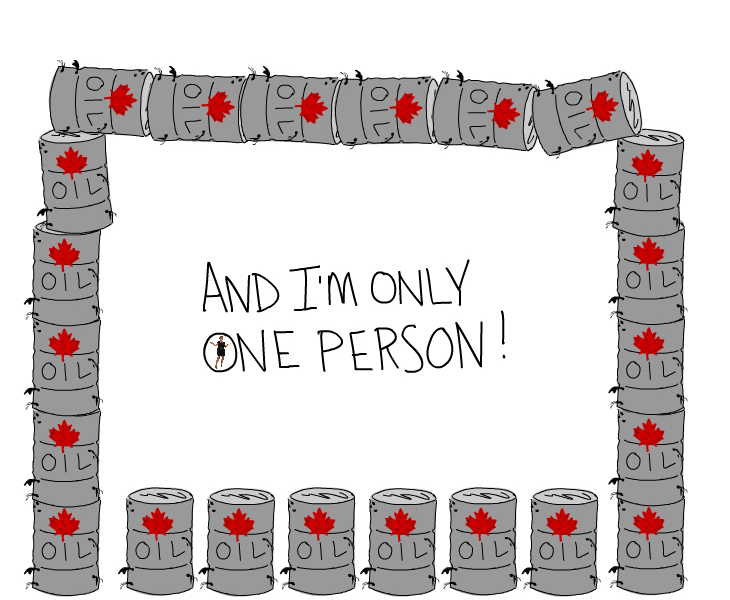 Right now the European Union is deciding whether to slap a “dirty oil” label on oil from Alberta’s tar sands. 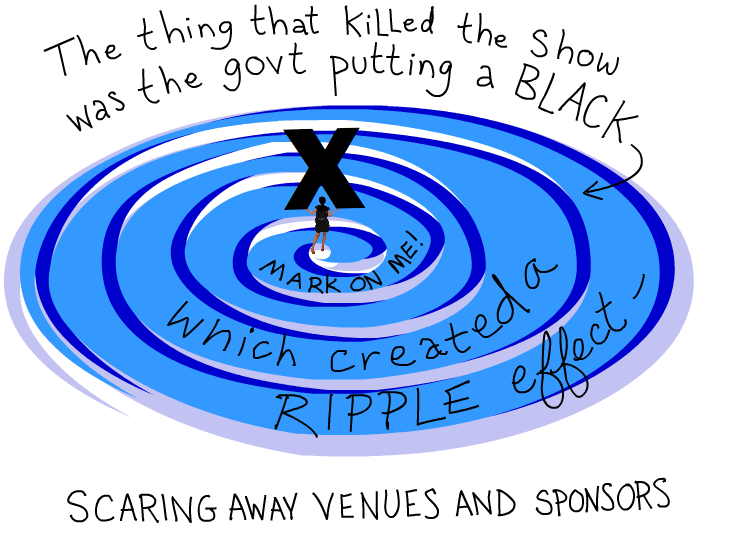 My show would have happened at an inconvenient time for their PR campaign to greenwash dirty oil. Last week, our Environment Minister Peter Kent called two New Democrat MP’s “treacherous” for speaking against the oil sands. Pat on your shoulder, Franke- we need to stick together as a people with an interest in the future-ahead we go everybody in their own fashion! Yours is amazingly elaborate and beautiful, Franke. Banning art only shows the totalitarian bent of this government. The Harpercrits are dangerous to our freedom! How did I not know about this? Wow, mind blowing. I love the suggestion for a downloadable postcard for us to send to Harper!!!! I agree that the downloadable postcard is a great idea. Will send you an email when I’ve got it ready. You represent far more than Harper does. Thanks for your courage and will. 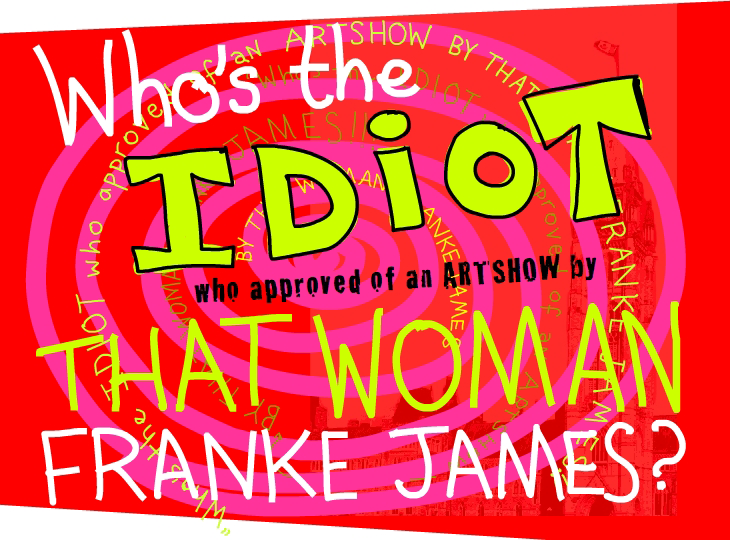 Brava, Franke, fabulous artist, & all your good helpers who got the word out about this attempt by the Harpies to stifle your work, the invitation to exhibit internationally, or anywhere on this earth, and your right to your own opinions as a Canadian citizen, the whole ball of wax. I will do my bit to spread this positive push-back message. 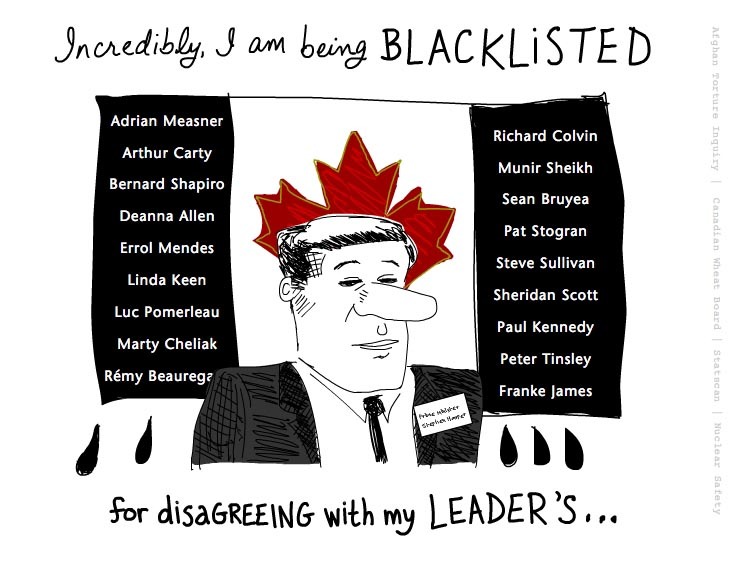 You have joined some very fine minds on the infamous Harper Black List of those who dared to disagree with him in a public and articulate way. Your humorous and artful essay is a very effective response to such heavy-handed, fear-based censorship! My thesis — he does represent a Canadian view that we want all we ever had, we will hang on to it, we will not change, we will not take less. We will sell like mad all raw commodities that we have to sell, just as if it is still 1950. The great middle class will not let go of its materialist lifestyle. Fear rules us. 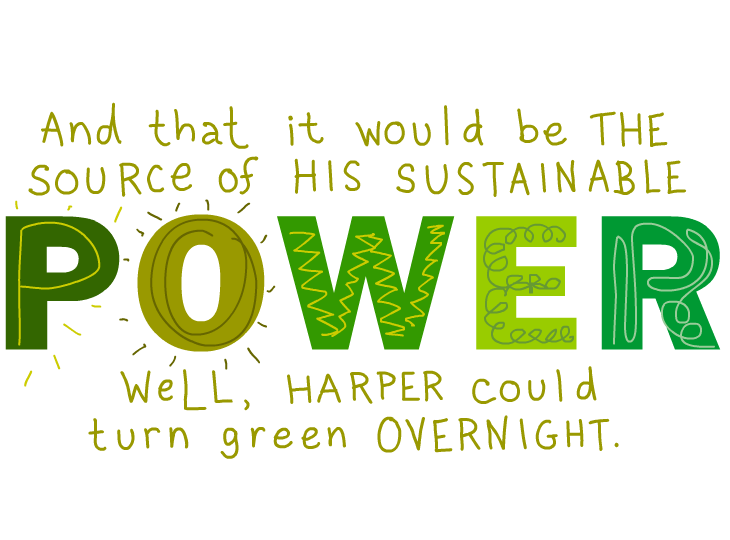 Harper speaks perfectly the language of that kind of mind and consciousness. Thank you for your comment and for signing the Care2 petition and adding the comment below. Very well said! This reeks of McCarthyism, quite frankly, Prime Minister. 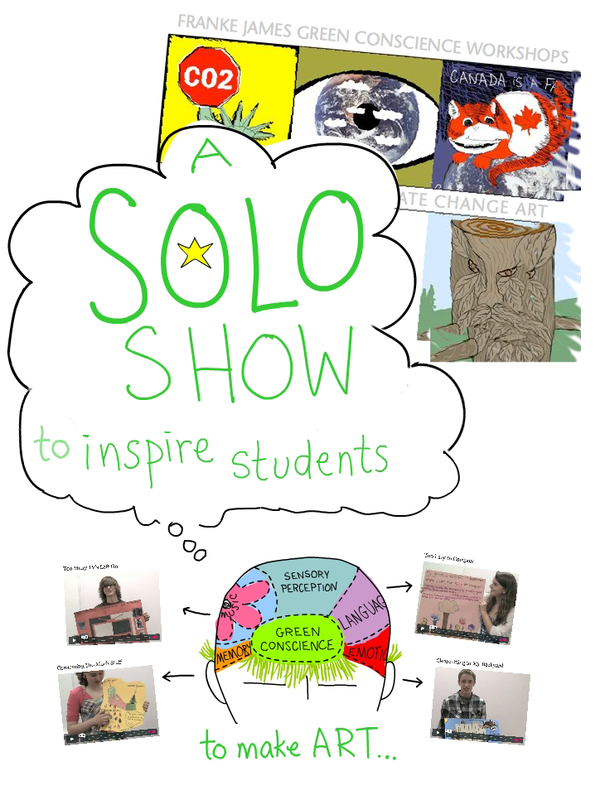 To yank funding when a Canadian is invited to exhibit and to work with school children INTERNATIONALLY is to invite the kind of trouble you are now in. Censorship and repression are official forms of bullying. You are a bully and it is most unfortunate that we have to suffer your “I have a majority” vision of democracy (sic). But how delightful it is that you would attempt to repress an artist of this stature who is so very good at responding creatively to challenges. What fun to see a spunky David taking on a big fat Goliath, swatting heavy-handedly at someone who is so nimble and smart and so darn opinionated! Franke, you are what I aspire to be! Thank you for everything you have done, are doing and will do by your brilliant actions. hi i am a ten year old boy who is very concerned about where this country is headed. 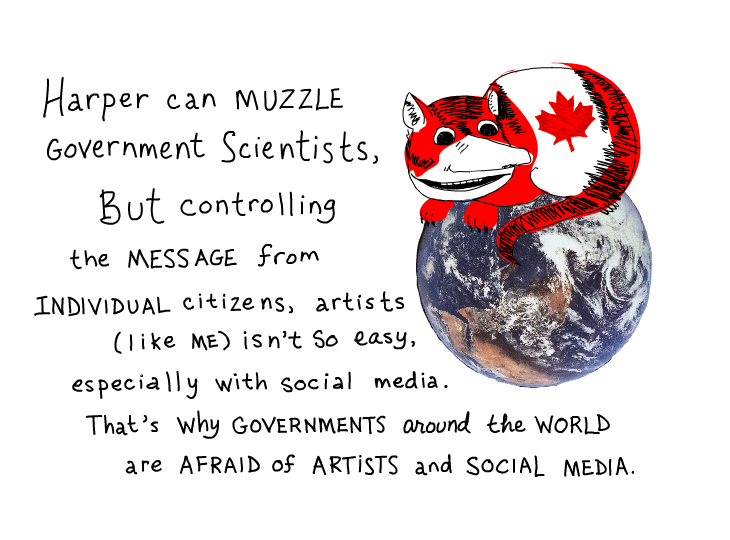 Canada is a free country and yet Harper thinks that he can just take away peoples right to speak freely and be artistically creative. 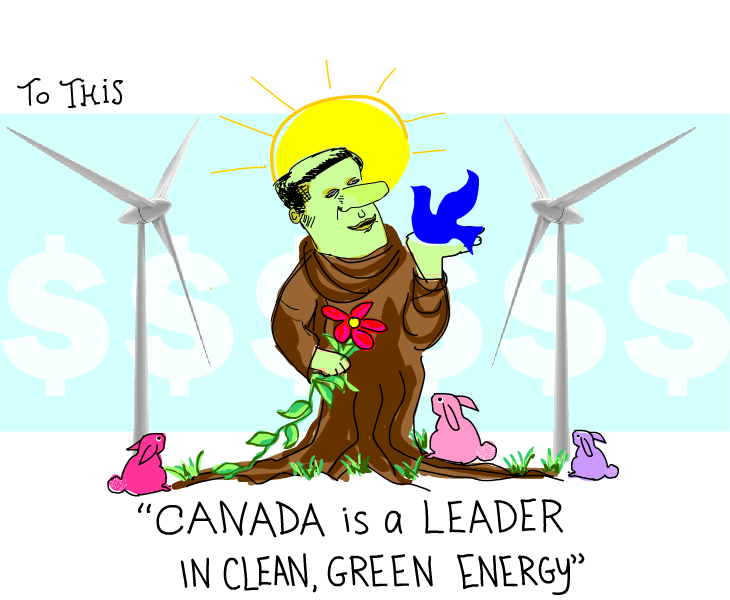 How come Harper can dictate his views about Canada yet Franke can’t? Personally i don’t want to clean up Harper’s mess when I’m older; i think Harper Harper should start mopping right now. Thanks for your hilarious and powerful art work. Thank you for bravely sticking with this for all of us. 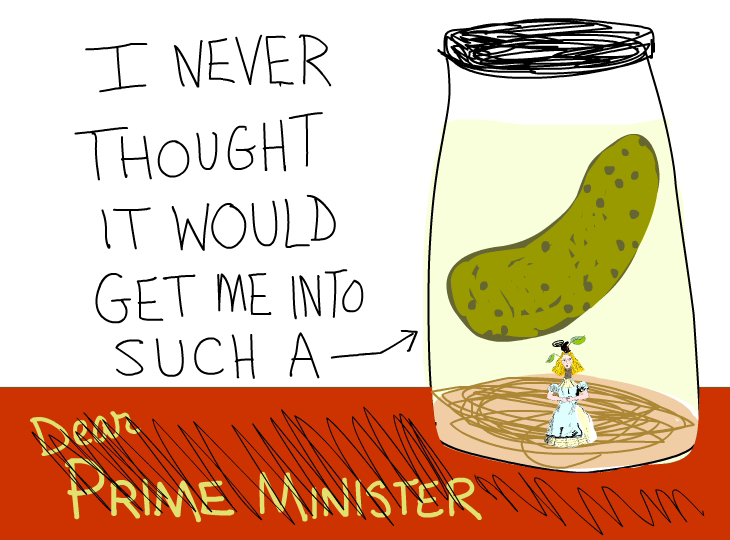 I look forward to your downloadable postcard to send to our Dear Prime Minister. Franke; This is great. Artists are the canaries in the coal mine, when they stop singing we are all in big trouble. 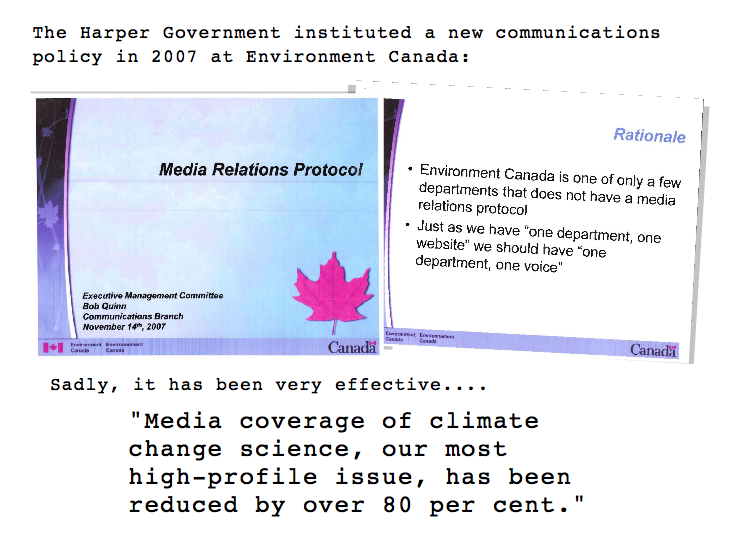 Harper started silencing journalists as soon as he took power. They had to submit their questions ahead of time and he chose who was’SAFE’ to talk to and who wasn’t. Unfortunately, the majority of Canadians have their heads in the sand. Life is pretty good in Canada. That is why we are not concerned when our voices are muzzled, the crime laws get changed to lock up more people, or the oil companies get off scott-free. By the time we wake up-ie when something nasty happens to us personally because of government policies-only then will we wake up. A politician thinks of the next election, a statesman thinks of the next generation. 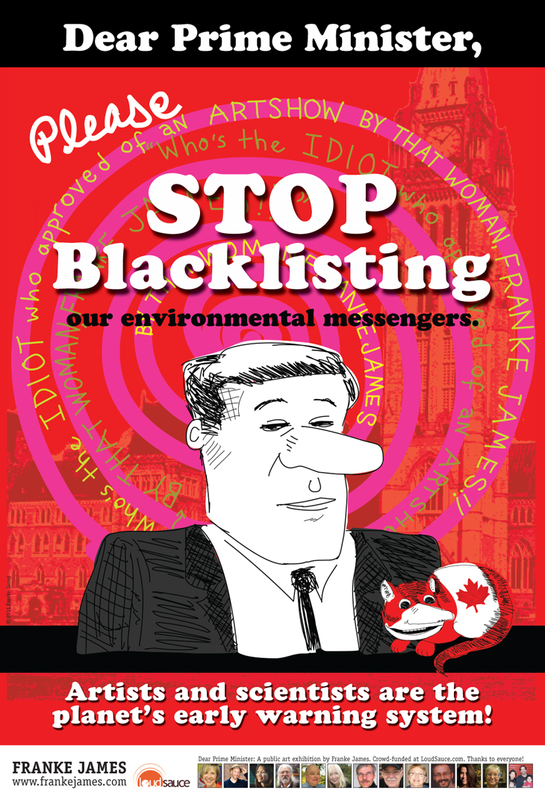 There are no statesmen in Ottawa now and since tar sticks to tar Harper attracts the low- lifes and the yes- men and the ones who toe the party line. Wow. Your story amazed … and frightened … me. 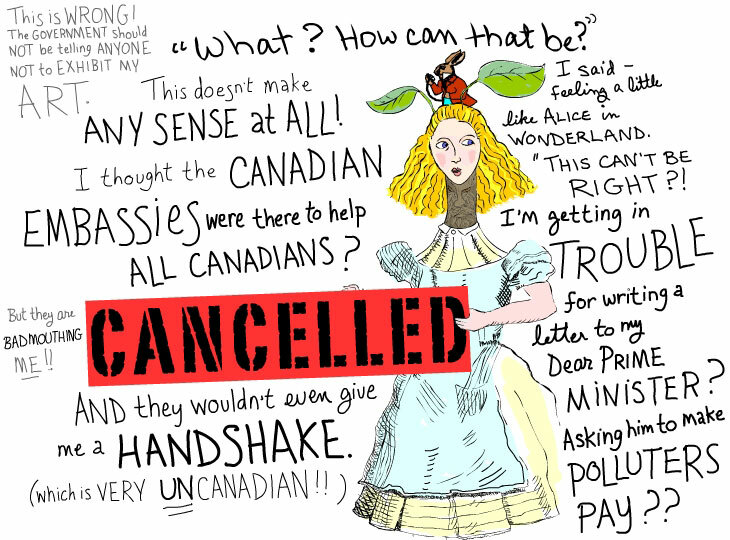 Thanks for making us aware of how easily the Harper Gang can stifle Canadians’ voices. And how delicate our democracy really is. As a former conservative, I am disgusted. As a Canadian, I am proud to know there are people like Franke James. Well, there may be an upside to this for y’all Canadians. Your neighbors to the south are becoming less and less inclined to seek refuge in your relatively more progressive, polite, open-minded, conscientious climate. So, at least you can have that to be thankful for. 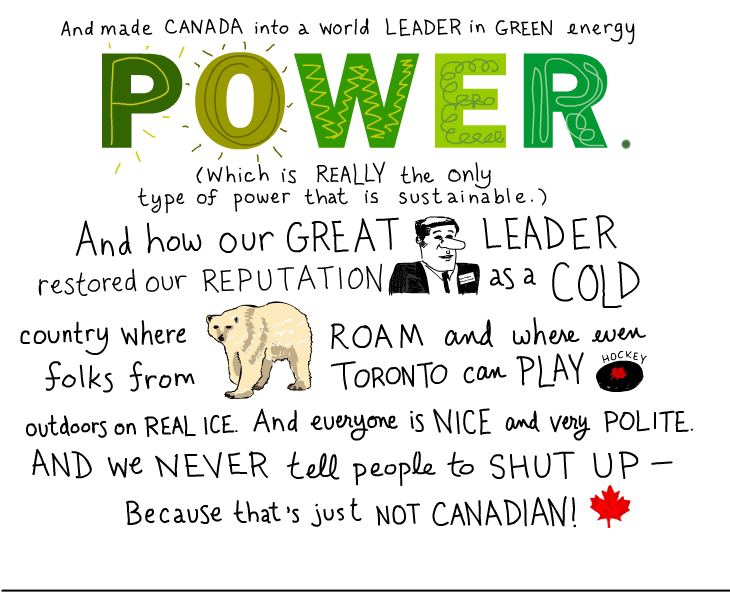 Really, though, it breaks my little American heart to see Canada following in our dirty carbon footprints. However, YEAH! to Franke! And YEAH! to those who made your populist art show happen. Fantastic….thank you. Great to see artists at work. 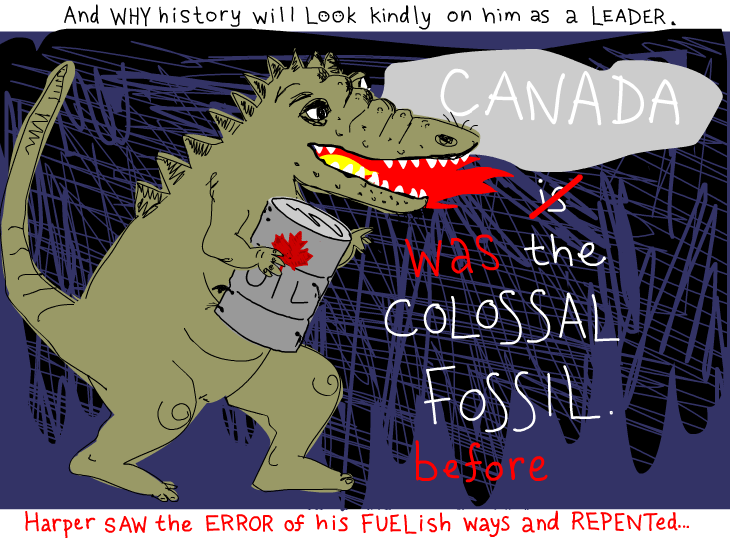 We do not want to see Harper’s vision of Canada come true. More protests, more art!! Fantastic. I knew nothing about this but I do now — and am excited by your action and energy! More power to you! This is so perfect. Well done Franke and to all those who brought this together. Our silence is our worst enemy. In time our governments will pass and new people will be steering this planet with whatever resources are left and wisdom collected along the way. I loved the video, even more than that I loved your style Franke. You still came across as positive where most would have expressed more anger. I’m looking forward to seeing more and hearing more from you. 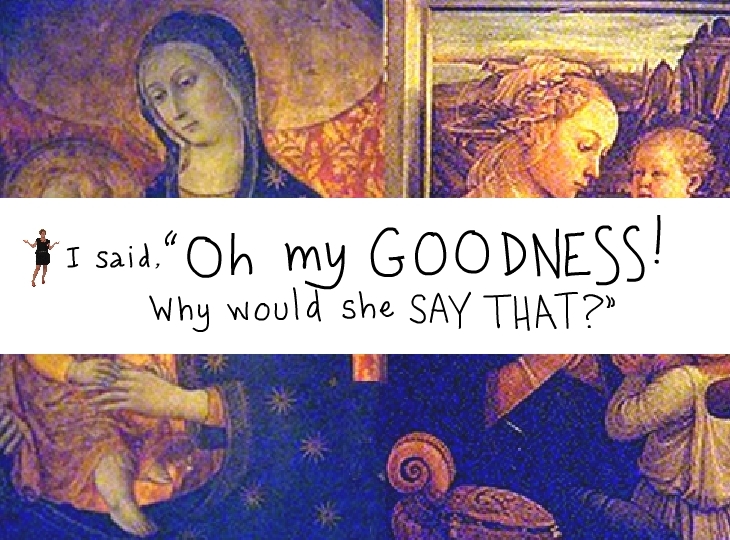 I won’t tell you how it ends — but it made a difference in how I talk about my book. Let me know what you think. … and when can we expect to see your work in Europe? Yikes, how time flies…. 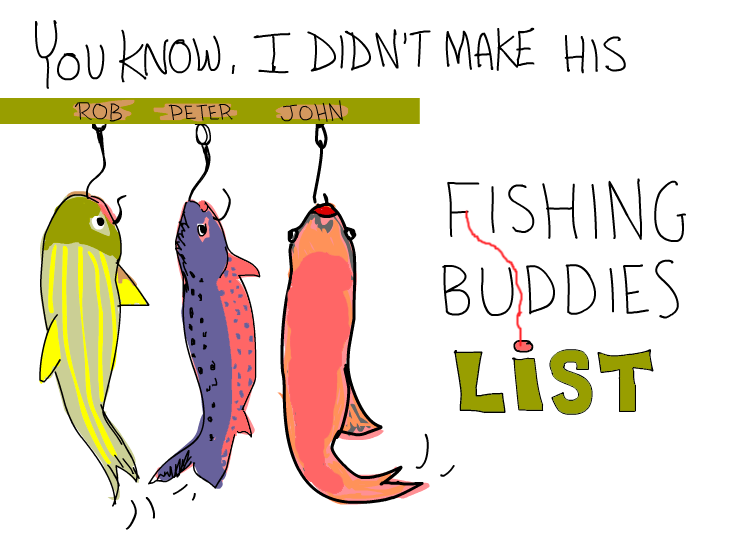 Just held barely held my gag reflex in check listening to Peter Kent justify Canada’s deplorable position in Durban. 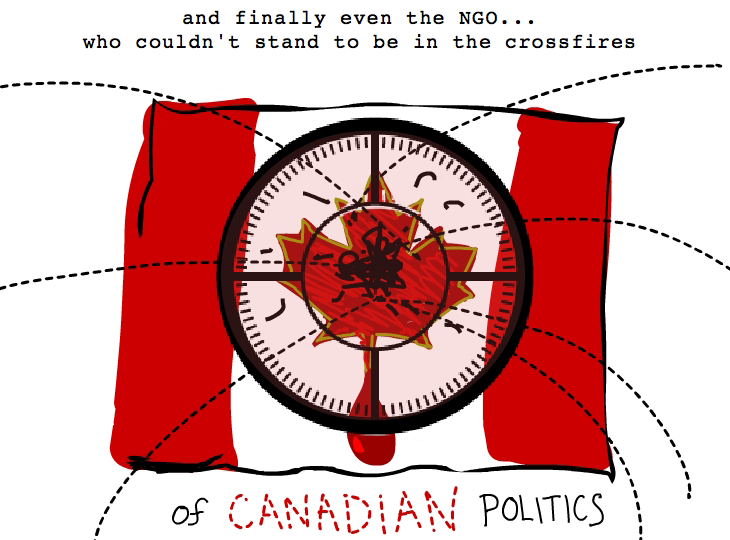 How many hits to our collective Canadian conscience will it take to ditch these guys? 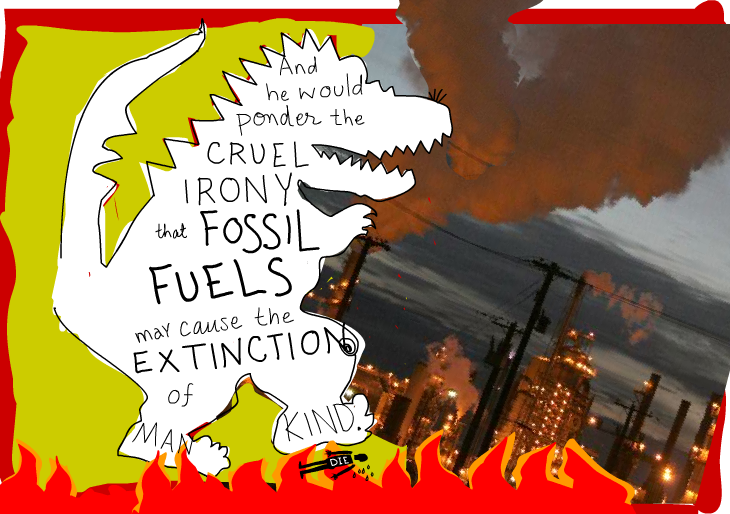 In my frustrated rage I see the Parliament lobby filling with lumps of coal- one for every creature and child on this planet doomed by climate change. Oh, if only the ghost of Christmas future could work his magic on this government. 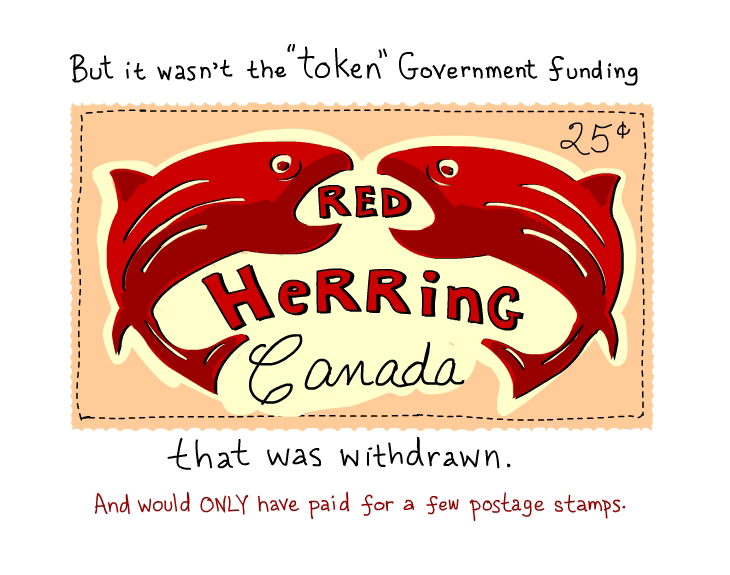 How about a blackened, crumbling upside-down maple leaf for Harper’s postcard. I tried drawing one but it looked like a dead jelly fish. 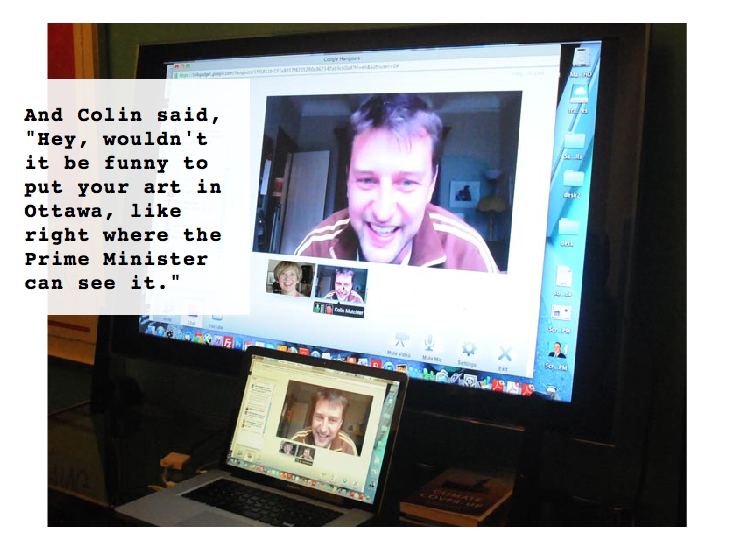 What fabulous smart holistic trouble making you do in your art. KEEP IT UP. This is the essence of political art. Great video and interesting article Franke! 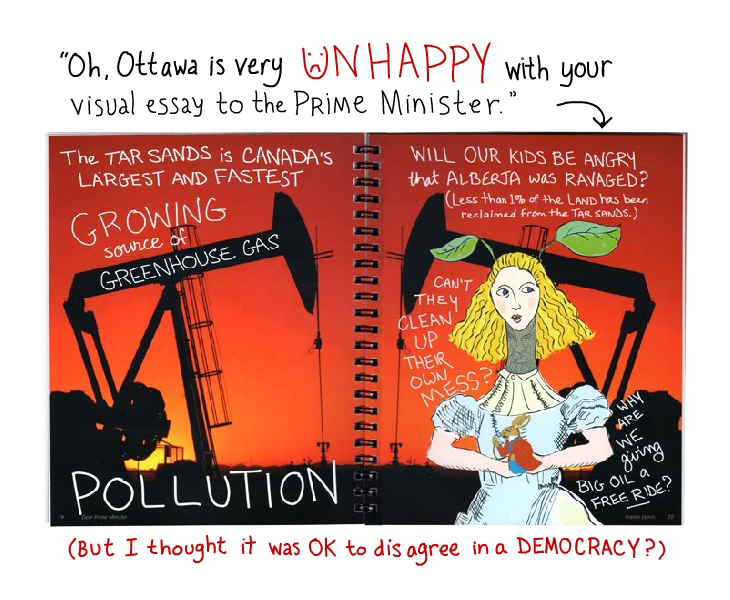 I don’t know why I didn’t hear about your Ottawa enviro-political-art show sooner, but am still thrilled at how this whole thing has worked out. 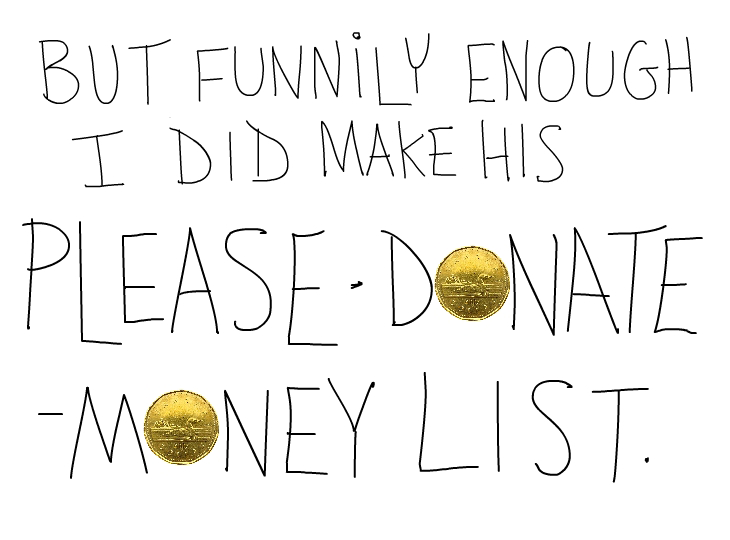 I had sent money to your sponsors for the 20 city tour, and was shocked to have it sent back. And in pursuing it with them shortly after found out about the Govt’s interference in it. I, and 2 of my friends, Claire and Bob, came to your house on (I think it was) Earth Day a couple of years ago, and had a great afternoon with you and others. I have loaned your book to several friends. Claire keeps hers on the little table in our waiting room at work for all to peruse. I am so happy that you took advantage of a yucky situation and it turned into a great experience for you and a terrific educational experience for many. One would wonder if every time one signs a petition against any action of a provincial or federal government with both one’s full name and address required , one’s data are not collected and classified as “black list” material. I am too old to worry about that now and I really don’t care. Do we really have a democracy in Canada ? These days, I tend to think not. 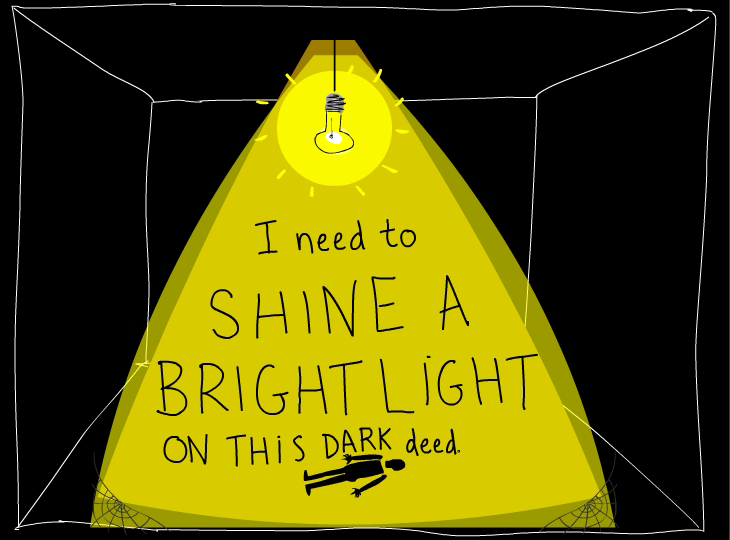 What we have is something even more dangerous: we have a pseudo democracy that keeps most people in the dark: hey! people are too busy figuring out how they are going to pay their mortgage, make ends meet or pay for their kids’ university funds… or in my case about their retirement! I am thrilled to hear your story, that you didn’t back down and that others backed you up. I wish some day that I might be able to muster the power to fight for children like my son, who are left as seat warmers by an educational system, badly in need of reform and restructing to address the learning needs of all students and a psychiatric profession that needs to recognize severe speech delays as the impediment to learning and inspire educators and aligned professions to treat the problem, not play the blame game. I’m proud to hear that a fellow Canadian has taken a stand and I think make herself be heard and hopefully made a difference. Well done, Franke! So very clever and creative. I urge you to take this to many Occupy sites or groups. You can do it on the cheap by getting local groups to chip in and cover costs (and use billeting with local people, etc.). I am so splendidly excited by your work. Here in Montreal we have been mobilizing, hosting speakers and conferences on this issue and the deleterious affects on those Aboriginals who live alongside the horrors – the hole in the earth. Apparently the health of the Boreal Forest is in jeopardy, as is the fate of the caribou. In thirty years they could be effectively wiped out. Now those that are hunted by the First Peoples of that territory apparently carry massive amounts of tumours and are inedible. Thousands upon thousands of ducks and other birds have been wiped out in the tailing ponds. Among those who live alongside the ‘sands’, the rates of rare cancers, such as bowel cancer, sores; and recently a doctor who reported on this had his license taken away, then reinstated. We are talking about choking off the tar sands, standing tall and unified in halting all pipelines and blocking further development. Thanks for all your work, on behalf of all of us and the planet and all its inhabitants. Thanks for future generations, including Harper’s children and grandchildren. Franke: You are brave and brilliant! How can this Federal majority government be called a “democracy”? Then they came for _______________________ and there was no one left to speak out for ________________. I hope I could be as brave as you are! Wonderful story – to be shared!! What a totally awesome article, ingenious, artistic, well put together and very sad that our government would need this to tell them how badly they are doing.